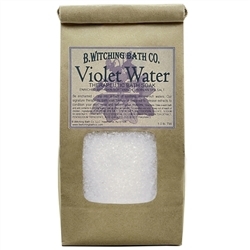 You are here:Home > Search for "violet"
Soft and feminine, sweet violet bouquet. Our luxurious liquid cleanser formula enriched with flower distillates, natural honey and nutrients, it gently washes away dirt and germs while leaving skin soft, smooth and lightly scented. 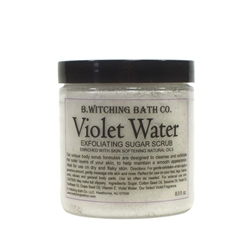 It can be used as hand soap or luxurious bath and shower gel. 8 fl. oz. 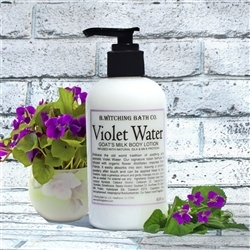 Renew your skin with the old world tradition of feminine violet water. Sugar, spice and everything nice, that is what beautiful skin is made of. Our unique blend of naturally exfoliating sugar, rich emollient oils, Vitamin E and delicate fragrances banish away rough skin, leaving it silky smooth and lightly perfumed. This gentle formula may be used anytime, even after shaving. 8 fl. oz. 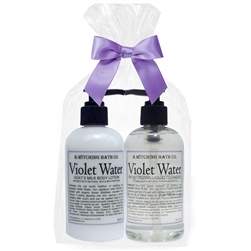 Embrace the old world tradition of soothing and aromatic Violet Water, a softly floral nostalgic aroma. Our select formula is infused with organic flower distillates imported from France. This goats milk body lotion is super rich and packed with creamy goats milk and other skin nourishing ingredients it is the perfect recipe for silky smooth skin. Infused with natural botanical extracts, it will leave skin lightly fragranced with our soft feminine scent. Simply sensuous! 8 fl. oz. 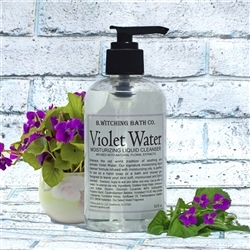 Soft and feminine, sweet violet aromas will brighten the air in your home. Our collection of soy wax candles are the perfect complement to our bath products and designed to match our rich fragrances. They are handcrafted in the USA soy bean wax and zinc free cotton wick. Simply packaged in a 9 oz. glass jar with a matching lid and a graphic designed kraft label. They burn clean for over 90 hours, radiating the fragrance to the whole room.